Hot Set Apparatus (Dial Gauge Model) - S.S. Instruments Pvt. Ltd. Laboratory Hot Set Test Apparatus is designed to determine the elongation & permanent set of insulation of armored and unarmored single, twin, three , four and multi-core cross linked Polyethylene (XLPE) insulated & PVC sheathed cables for electric supply and control purposes under specified conditions of load temperature and air flow. : SSI 521 HSVS (Hot Set with Digital Caliper for elongation Measurement). Laboratory Hot Set Test Apparatus is designed to determine the elongation & permanent set of insulation of armored and unarmored single, twin, three , four and multi-core cross linked Polyethylene (XLPE) insulated & PVC sheathed cables for electric supply and control purposes under specified conditions of load temperature and air flow, as specified in IS: 7098. Inner dimensions of the chamber are 30 cm x 50 cm 20 cm (W x H x D). Full view glass Door to observe the specimen under test. Temp. Range 250 ± 2oC. at sensor point. The oven is designed to give 8 to 20 air changes per hour. Grips are provided at the top of the oven to hang specimen/s. Suitable weights up to 1 kg are provided with provision to attach the weights to one end of the test pieces. Metallic arrows are attached to facilitate the operator to take exact reading of the sample elongation. A blade is provided in the oven to cut the sample to remove the tensile force without opening the door. The sample is hanged using the grips inside the Hot Set Oven along with the weights for 15 mins. The sample starts to elongate due to heat. 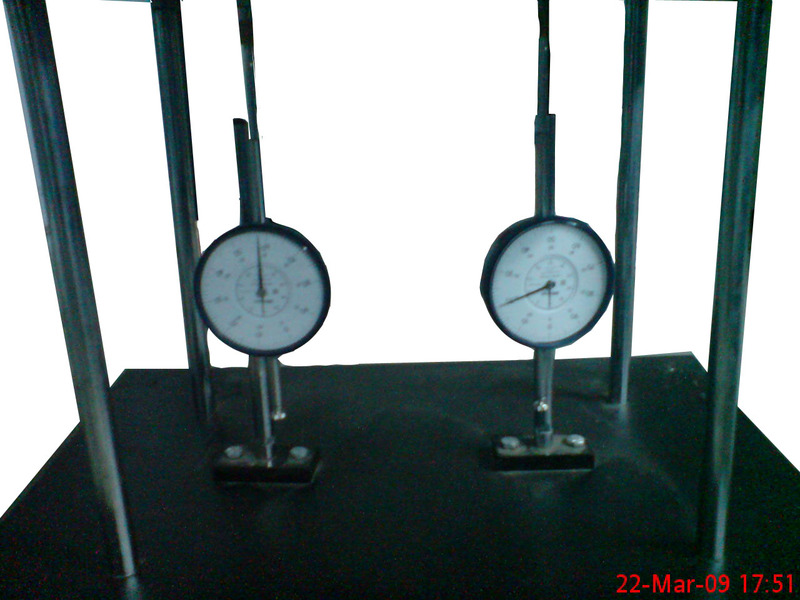 The elongation of the sample is measured using Dial Gauges. The sample is then cut to evaluate the permanent set. Also if normal oven is used for the test, the operator will have to open the front door to hang the samples, resulting in loss of temperature. As the test is only 15 mins, it will not be possible to regain the temperature. In our Hot Set oven, we use an especially designed Top Hanger which can be hanged from the top of the Hot Set Oven, without opening the front door. To achieve minimum loss of temperature, we provide two hanger assemblies. One is used as dummy that is used for achieving the desired temperature. In the meanwhile operator can assemble the sample, weights etc on the other hanger, which can be then put in the oven, just be replacing the dummy into the oven. This way the loss in temperature is not more than few degrees. Air source to provide 8-20 air changes per hour, a compressor compressed air line of 4 to 10 liters min. is required. If this facility is not already available, a suitable air compressor may be purchased from us. Sample Conditioning: The test specimens are required to be kept at a temperature of 27 ± 2 deg C for a period of 16 hours, immediately before the test. If the conditioning chamber is not available with you, the same can be purchased from us.